Rug Chapel is a highly decorated 17th century private chapel with carved angels, a decorated timber roof, and a magnificent collection of other carvings and extravagant paintings. 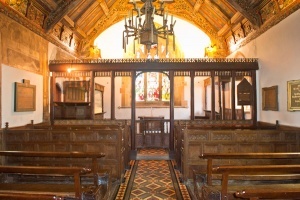 The chapel is located immediately north of the A55, at the A494 junction, just west of Corwen. 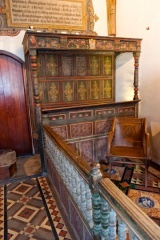 Rug was established as a private chapel by Colonel William Salesbury in 1637. Colonel Salesbury, who was known as 'Old Blue Stockings', later led the defence of Denbigh Castle for the Royalist cause. 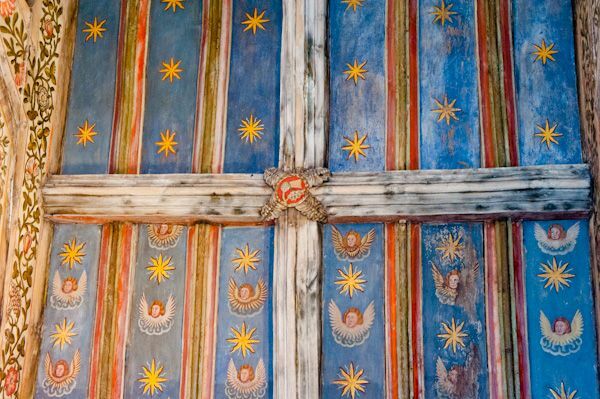 He obviously had no affinity for the then-fashionable Puritanical ideals of simplicity and lack of adornment, for he decorated his chapel with the most wonderful array of paintings and woodcarvings. 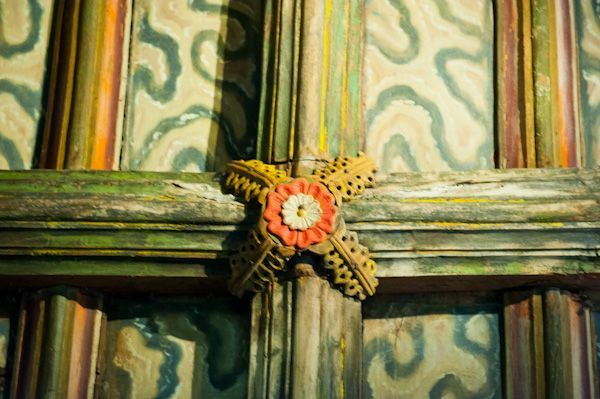 Almost no surface of the chapel interior was left untouched, and the result is simply astonishing, whatever your preferences for church interiors! 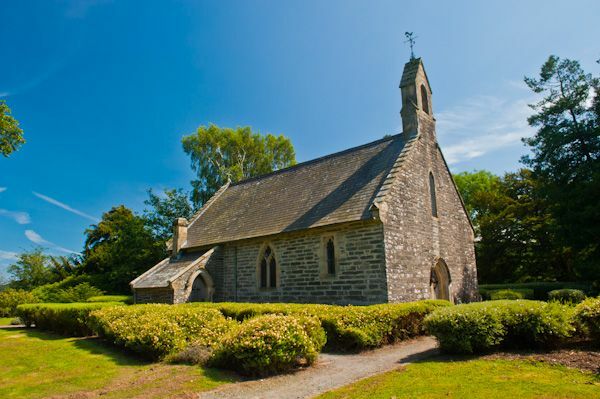 But we're getting ahead of ourselves; the chapel is set in a garden glade, surrounded by a belt of tall trees which serve to create an air of woodland calm, despite the frequent traffic noise from the busy A-roads nearby! 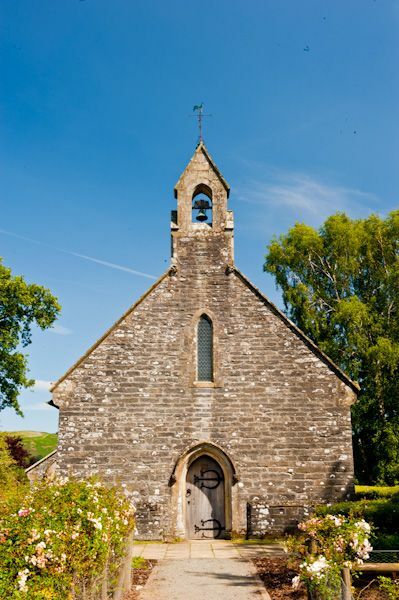 From the outside the chapel looks exceedingly simple; a single-celled building with a small bell turret at the west end. But enter within and that air of simplicity is soon dispelled. 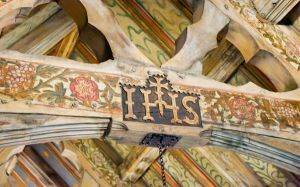 Every surface is carved or painted, from the rafters of the roof to the benches that line the interior. 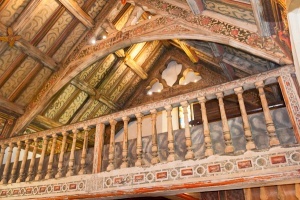 The spectacular roof is carved and painted from one end to the other, with projecting angels echoing a medieval angel roof. There are floral designs, animals, cherubs, religious symbols, and a skeleton to remind us of the impermanence of life. 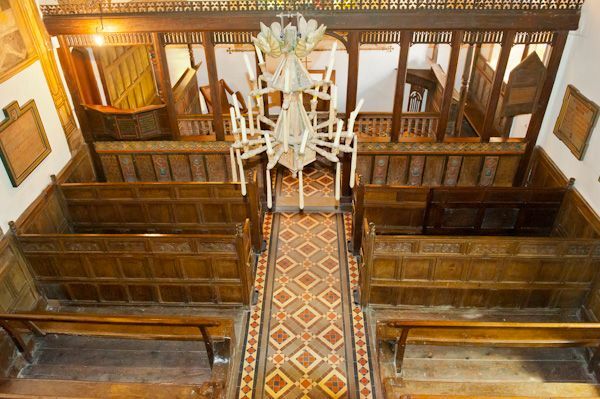 A gloriously carved and painted gallery stands above the west end, and you can climb a set of stairs to the gallery for a wonderful view over the chapel interior. The effect is hard to overstate; it is quite simply stunning. Do not miss Rug Chapel! 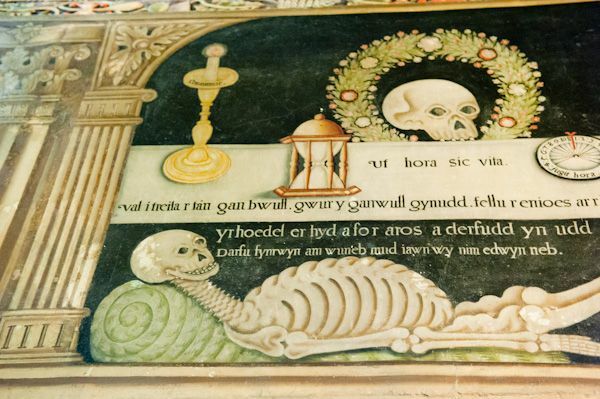 A ticket to Rug gives access to Llangar Old Church when it is open (I highly recommend a visit if you have the time).